Many of us live lives of perpetual motions of our own making and blind adherence. It’s where we operate all day long – on the surface, exposed to what the world sees everyday on the outside. It’s the day-to-day living of work, marriage, children, family, friends, church, recreation, obligations, all of our comings and goings. Much of life is like a rock skimming the surface, a superficial life. In truth it’s like life in The Matrix, that odd but profound movie where all is not as it seems but is hidden with real truth below the surface, below the façade. But it’s a good life. We can spend our entire lives merely living in the Matrix, above the surface, getting by and existing, perhaps even thriving. We can be happy solid citizens who mean well, do well, work hard and help our fellow-man. We can obediently go to church each Sunday, participate in good community service projects, be good neighbors, and even tithe once in a while. Models of good and decent living. So what’s the problem? The problem is that it’s an 80% life. We were meant for so much more in this life than living this busy but casually blind existence chasing depth but often finding superficial illusion, disappointment and even deception. Dare I say that this is the life of many in the Christian community? It was for me, an 80% Christian for much of my adult life. Not bad, just decent, at least most of the time. Going through motions of trying to be “a good Christian.” Actually living in deception and blindness, certainly not the 100% life available to us all. Some, the few, the broken and surrendered, learn to live life beneath the surface, in the depths of living Truth. This is a life wholly connected with Truth and aligned with a life fully “in Christ” and “for Christ,” not simply as a superficially observant Christian. This life is dangerous, risky and uncertain. It’s a life of sold-out, all-out surrender and devotion to our Creator and Savior. What risk, but what peace. The world and its idols can only give us what we think is peace but is actually nothing like the real thing. The world, the grand appearance, is enticing and attractive as it lures us to its lair. It’s a mirage – ultimately empty and will leave us longing and unsatisfied. It’s an insidious deception. Like climbing the proverbial ladder and realizing that it’s leaning against the wrong wall. It’s more than the popular notion of “living out your faith” by some public action of service or being nice to people at work or in your neighborhood. Your faith is your life. It’s prayer on your knees. Every day a surrendering, really. It’s following and surrendering to Christ as the way to do life. It’s the only way that is full and complete and true. It’s a life that allows one to live in peace, joy, vibrancy and vitality while walking in fellowship, confidence and harmony with the God of our creation. Yes, we can have it all, peace and joy even in uncertainty as one walks in God-listening obedience. But first it’s an awakening in heart, mind and will from our comfortable, idle slumber to a walk into newness of life, toward God, His Word and His ways. Not half-way, not even 80%. It’s 100% or it’s a misled life. 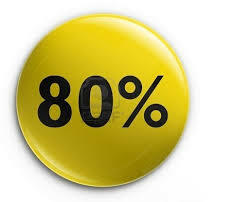 Are you living an 80% life?